Akaka is well known for its waterfalls, forest trails, and abundance of Hawaiian wildlife. Akaka Falls State Park in the U.S. state of Hawaii. The Akaka Falls State Park, a natural attraction spanning an area of around 65 acres, is located in the northeastern Hawaii Island of the U.S. State of Hawaii in North America. The central feature of this park, the Akaka Falls, is well-known for its spectacular beauty. More specifically, the Akaka Falls State Park is located in a canyon 23 kilometers north of the nearest city of Hilo in Hawaii County. The state park can be accessed from the nearby village of Honomu, situated 6.5 kilometers from the park. The waterfall at the park is surrounded by lush, green rainforests with its own unique flora and fauna. 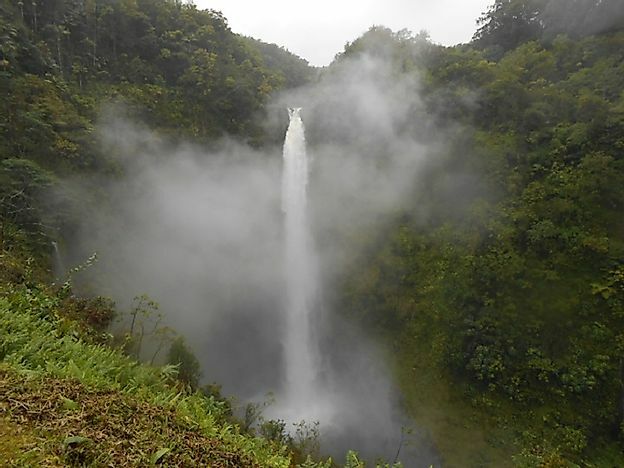 The Akaka Falls State Park has remained pristine and untouched for a long time in history. Very little evidence exists regarding the presence of early human life in the region. The area could have been inhabited by ancient Polynesians thousands of years back. Archaeological evidence of early human habitation, dating as far back as 300 AD, has been detected in other parts of the Hawaiian Islands. With the arrival of the Europeans to Hawaii, the islands were thoroughly explored and its natural resources heavily exploited. Only a few places like the Akaka State Park still remain in their unspoiled state today with little human interference in the area. Every year, thousands of tourists arrive at the Akaka Falls State Park to catch a glimpse of its stunning Akaka waterfall. The huge 442-foot drop of the Akaka Fall with the backdrop of dense, thriving tropical overgrowth, offers a real treat to the eyes. Every year, thousands of tourists arrive at the state park to catch a glimpse of this fall and its surrounding flora and fauna. A 0.4-mile-long trail leads visitors from the parking lot to the Akaka Falls and further up to the beautiful Kahuna Falls. Photographers often visit the Akaka Falls in the early morning when crowds are low and they can capture a mystic portrait of the falls. The Akaka Falls State Park has an extremely diverse vegetation pattern with trees, bamboo, vines, ginger, orchids, Hawaiian ti plants, and a wide variety of other exotic plants. The park is also heaven for birdwatchers as they can sight elegant birds of paradise and other colorful bird species sailing through the air in the park or roosting in the trees near the falls. One of the unique species observed at the Akaka State Park is a type of goby fish named the ʻoʻopu ʻalamoʻo. The fish resides in the Pacific Ocean but at the time of spawning migrates all the way from the ocean through the streams and rivers leading to the Akaka Falls, to lay its eggs in the streams above the Akaka Falls. With special suckers in their body, these small (about 3 inches long) fishes climb the cave wall behind the falls to reach the stream above it. After the eggs are laid, they are washed down to the ocean by the flowing water where they hatch into new fish. Like all other parts of Hawaii, the Akaka Fall State Park is subject to present and future potential threats from anthropological pressures. A future possibility of an even higher tourist footfall in the park might threaten the pristine nature of its ecosystems. Today, Hawaii houses 40% of the endangered species of the United States. If the natural areas in Hawaii like the Akaka Falls State Park are not properly maintained, monitored, and protected, a large number of endemic flora and fauna of this archipelago might become extinct within the span of a few decades.